Programmable by way of detachable display front, process calibration, signal simulation, password protection, error diagnostics and help text available in several languages. • Linearized, electronic temperature measurement with RTD or TC sensor. • Conversion of linear resistance variation to a standard analog current / voltage signal, i.e. from solenoids and butterfly valves or linear movements with attached potentiometer. 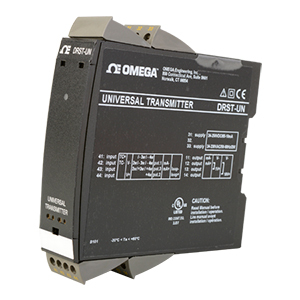 • Power supply and signal isolator for 2-wire transmitters. • Process control with standard analog output. Galvanic separation of analog signals and measurement of floating signals. • The DRST-UN is designed according to strict safety requirements and is therefore suitable for application in SIL 2 installations. • When DRST-UN is used with the DRSL-DISPLAY programming front, all operational parameters can be modified to suit any application. As the DRST-UN is designed with electronic hardware switches, it is not necessary to open the device for setting of DIP-switches. • A green / red front LED indicates normal operation and malfunction. • Continuous check of vital stored data for safety reasons. • 3-port 2.3 kVAC galvanic isolation. ∆t =: Internal temp.-ambient temp.